Detroit’s answer to the Asian and European Supercar invasion has arrived! Throwing off the constraints of tradition and starting from scratch, the engineers at GM built a revolutionary vehicle that’s elevated Corvette from a street fighter to supercar slayer. Don’t let its sculpted and athletic exterior fool you, this car easily backs up its tough looks. With lightweight aluminum replacing steel, and carbon-fiber and carbon-nano composites dropping the cars weight, this Stingray is all business. To harness all this power, GM installed its legendary Magnetic Selective Ride Control with its distinctive 6 speed automatic transmission making quick work of gear changes. The all new redesigned interior surrounds its driver with a leather wrapped interior never seen in any Corvette and also pleases it’s drivers with an all new LED gauge cluster. 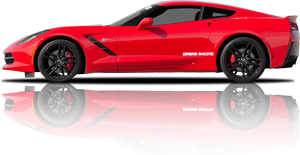 Drive the Stingray and experience firsthand why this monster has won over 20 industry awards including 2014 North American Car of the Year. Finally, the moment you’ve been waiting for: get behind the wheel of the Corvette Stingray, strap in and start your engine! You’re in control, it’s time to hit the track for 5 or 7 exhilarating laps around the Las Vegas Motor Speedway infield road course.